Today's Worship Quote of the Week is another prayer/poem by Ulrich Schaffer. Perhaps we could call this a modern-day psalm. Have you written a psalm lately? and then to reject or emphasize more. for which I will give up everything. 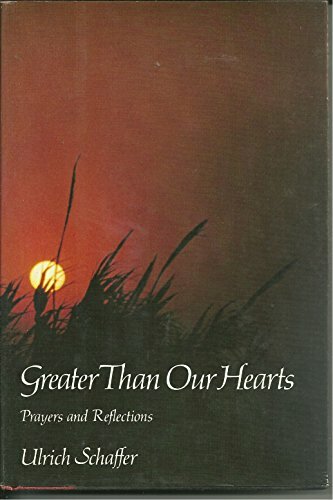 - Ulrich Schaffer, Greater Than Our Hearts: Prayers and Reflections (New York City: Harper and Row, 1981). Do you hear the words of the scriptures in this poem? Of course, the "pearl" and the "treasure" come from Matthew 13:45-46 and Matthew 6:21, but which lines are echoes of these other passages: Psalm 25:5, Psalm 27:14, Psalm 100:3, Matthew 5:16, Luke 14:26, John 12:25, 2 Corinthians 5:17, and Philippians 3:7-8? The list could go on and on. Far too often, for me, Jesus is only one of my treasures. He's a pearl of great price among many other wonderful possessions that compete for my attention, affection and worship. This poem/prayer/psalm gives me a bold challenge to "reject or emphasize more." Today's WORSHIP QUOTE is a short psalm, a prayer-poem about the need for honesty and authenticity in our relationship with God and others. Let us feel our own lies. "bungling." See Psalm 51 and Isaiah 1:10-18. - Ulrich Schaffer, in GREATER THAN OUR HEARTS: PRAYERS AND REFLECTIONS, Harper and Row, 1981. Do you hear the words of the scriptures in this poem? Of course, the "pearl" and the "treasure" come from Matthew 13:45-46 and Matthew 6:21; but which lines are echoes of these other passages: Psalm 25:5, Psalm 27:14, Psalm 100:3, Matthew 5:16, Luke 14:26, John 12:25, 2 Corinthians 5:17, and Philippians 3:7-8? The list could go on and on.